Sigma has just announced that its 30mm ƒ/1.4 EX lens will soon be available in Pentax and (heh, heh, heh) Konica-Minolta mounts. The latter meaning that sooner or later I will get around to testing it. The picture above is from dcview.com.tw, by way of GZLive.com, which has more pictures of the lens (which appears to be huge) mounted on a Nikon D70 at the link. Just to point out that the article is at "dcview.com.tw" (no 's'), not at the "dcviews.com" site. I've had a brief play with this lens on a D70 and it is indeed rather fat and heavy. I suspect on my Pentax DS it'll be a little overpowering. Briefly looking at some old numbers, it's over 1cm longer and 2cm fatter than most 50mm f/1.4 lenses of yore (except for the canon ef one, which has a fat layer of...protective plastic armor). I think i'm going to go lie down too. Yes. I had one briefly, and it is indeed big and heavy. So much for smaller formats giving us compact lenses and cameras. I had to return mine because it was a dud. The center was actually less sharp than the edges! I chose not to get a replacement, because trying it I realized I was not really hankering for a Normal lens. It is not wide enough to take in a whole scene, and not long enough to pick out details. What we need are good, compact wide angle lenses. What does it mean "heh, heh, heh" near Konica-Minolta? I suspect the size has a lot to do with the film-legacy flange-to-film distances. The smaller mirrors of APS-C cameras don't require it, but the lensmount standards do. Thus a 30/1.4 is basically just as large as a lens of similar specification would be for a 35mm camera, since the objective diameter would theoretically be the same. 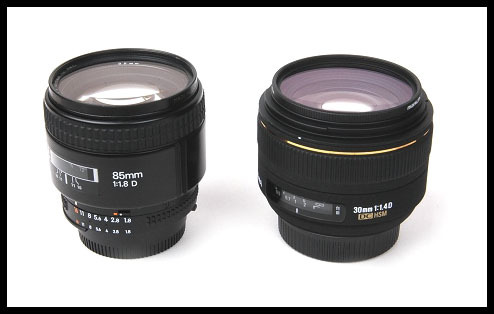 I'm generally puzzled and disappointed by the size of reduced-sensor size lenses, though. mj, have you tried the KM 28/2 lens? It is smaller than the sigma, full frame, sharper in the corners, and available now at B&H for an incredibly low price! I wonder how long it will be called the Konica-Minolta mount? Soon I guess it will be the Sony mount or perhaps the Sony/Konica-Minolta mount or the SKM mount for short. It's larger than a normal because … well … it's not a normal. It just plays one on TV. It's a wide angle lens that was designed to be made normal be sensor crop. It's a little fat on a D70, probably would be silly-looking on a Pentax, but has great balance on the D200. By all accounts the Pentax is a much better lens, just a shame it costs twice as much and is 2/3 stop slower, plus you need a Pentax camera to put it on ;-) Personally I'm saving the pennies for the DA21mm. Is any heap (!!!) but not bad lens ~50mm (for ASP-C) that you could recommend for K-M 5D. When will this lens be for sale in KM mount? I have not seen it anywhere since it was announced. Maybe it's not even going to come out in KM/Pentax mounts?